The immune systems in fish can weaken from stress, environmental factors and poor nutrition, making them susceptible to common fish diseases. You'll find all the necessary treatments for these bacterial and parasitic diseases below. The majority of these diseases can be prevented with routine maintenance such as partial water changes, water testing, and of course population control. Offering a full product line to treat bacterial and parasitic infections. Reduce the potential for common diseases and treat current with Microbe-Lift's complete product line of fish health treatments. Keeping your koi and goldfish happy and healthy offering a full product line of liquid and dry treatments. All natural anti-bacterial and anti-fungal remedies for koi and goldfish. A new approach to medicating your pond or holding tank, highly effective products with recovery-inducing benefits. A general fish tonic made from evaporated sea water. Improves gill function, protects against nitrite toxicity & reduces stress by helping to maintain a natural balance of electrolytes in the body fluids of pond fish. API Pond Melafix acts as an all-natural, antibacterial remedy for koi and goldfish diseases, including eye cloud, mouth fungus, fin & tail rot, damaged fins, ulcers, and open wounds. Use if you notice these symptoms among fish in your pond, or when adding new fish. Pond Melafix is safe for snails and other invertebrates, and will not harm aquatic plants, affect pH, or adversely affect your pond’s natural biological filter. Add 1 tsp. for every 50 gallons of pond water. Add 2 tsp. for every 50 gallons of pond water. Add 1 tsp. for every 50 gallons of pond water, once per day for 3 days. 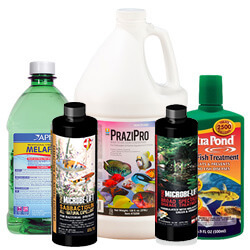 Ready-to-use, liquid concentrate that was developed to offer the hobbyist an effective way to control unwanted parasites in their pond, freshwater or marine aquarium. Extremely safe and highly effective this revolutionary product offers you rapid control yet will not negatively impact your biological filtration. Start treatment with a large water change or start with new water. Any water used should first be conditioned with ULTIMATE or a combination of ClorAm-x & Stress-X to remove ammonia, chlorine and chloramines. Do not stop filtration, but remove activated carbon, stop protein skimming & turn off U.V. Add 1 oz. per 120 gallons of pond water. Distribute the proper amount around the edge of the pond or directly into the filter box to achieve the best overall distribution. A single treatment lasting 5-7 days is normally sufficient. Retreat as necessary, but no more than once every 3-5 days. May be used as a preventative, at the standard dosage, when disease is likely.